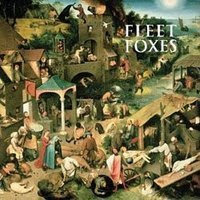 Entering the UK album chart at number 11 this week, new comers Fleet Foxes are giving a “whatsup wave” to the industry biggies just ahead of them such as Coldplay, Duffy, Neil Diamond, Paul Weller and The Fratelis. This is all the more impressive when you notice that L.A. rockers Weezer charted at only number 21 this week with their new album. Either Fleet Foxes are being majorly hyped (not really - just the same old Duffy and Lil Wayne posters everywhere in London), they've been given a load of great reviews to encourage something new and different into the music world or they are actually pretty good. I have to admit on the first listen their sound didn't really grab me and I have read of similar reactions time and time again in reviews. Additionally, at 39 mins and 11 secs long, blink and you’ll miss this album. The lyrics to the first track 'Sun It Rises' set the tone for the rest of the album with a country, blues, folk and gospel sound not unlike a song you'd expect to find on the ‘O Brother Where art Thou’ soundtrack. Red squirrel in the morning, I'm coming to take you home. The sun rises, over my head. Hold me dear, into the night. After many listens, I can confirm this album is definitely a grower. Their infectious sweet harmonies, compared in many reviews to The Beach Boys and Crosby Stills and Nash, are the main draw for me. Great finger picking, acoustic guitar rhythms mix it up with mandolins, flutes, dulcimers and kotos in addition to the requisite keyboards and pianos all form part of an unique, organic sound that is Fleet Foxes. The use of echo on the vocals creates a feeling of presence which then lends itself to blending back nicely into the harmonies. On times, I can even hear a slight similarity in sound to Chris Martins (Coldplay) vocals. Family business it might be, but small? Not any more. Fleet Foxes are taking the music world by storm and may find themselves in a position to give even Coldplay a run for their money for the top album slot over the coming week with the release of their self titled debut album. It was given 4.5 stars by Rolling Stone, and on June 6, 2008, they received 9 out of 10 in a review by Pitchfork. Fleet Foxes are great standard bearers for folk music and you would be mad to miss them play live this summer if you at all get the opportunity.